Osteoporosis is a common condition that develops as we age. The elements of bone begin to decay, making them brittle and susceptible to fracture. “Osteoporosis” means “porous bone”. Breaking a bone is a serious thing for older people: they are slower to heal and movement is often restricted. Women are more likely to experience bone degeneration; it’s estimated that half of all women and one quarter of all men over fifty will break a bone due to osteoporosis. Proper nutrition and exercise are critical to preventing osteoporosis. To maintain bone mass we need to eat the minerals from which bone is made so our bodies can keep up. Calcium, iron, magnesium, folate, phosphorus, and vitamins B12, D, and K are critical for bone strength. Omega-3 fatty acids are also important for reducing the risk of heart disease and keeping blood pressure and cholesterol at normal levels. Regular exercise and weight training (even light weights will make a difference!) also keep bones strong, maintaining bone density. Weight-bearing exercise also improves balance and muscle strength. 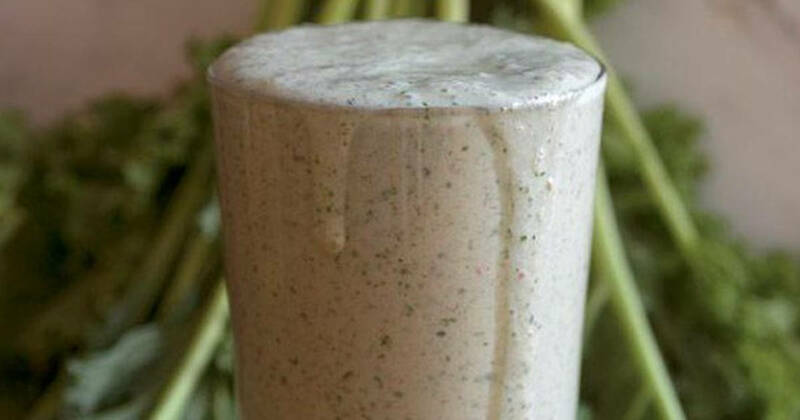 Enter this fabulous smoothie recipe. Kale is rich in iron, fiber, and omega-3 fatty acids. It’s got loads of all the stuff you need for healthy bones (except vitamin B12) with vitamins A and C to boot. It’s versatile and is good raw or cooked. It’s pretty, too. Bananas are full of potassium, as we know. They also are high in fiber (which we all need at every age) along with magnesium and other minerals, and phytonutrients that support the immune system–also increasingly important as we get older. Blueberries contain a powerful, delicious antioxidant, potassium, and manganese–a mineral crucial to bone health. They add fiber and a sweet tartness to this smoothie. Almonds are one of the most nutritional nuts, with protein, calcium, iron, magnesium, phosphorus, and potassium and the same amount of antioxidants as broccoli. Chia seeds are a fiber and protein powerhouse. A member of the mint family, the seeds of the chia plant have been used since ancient times. Due to their nutrient density, they increase energy and stamina. Rich in fiber, calcium, omega fatty acids, and antioxidants, they support bone and brain health. 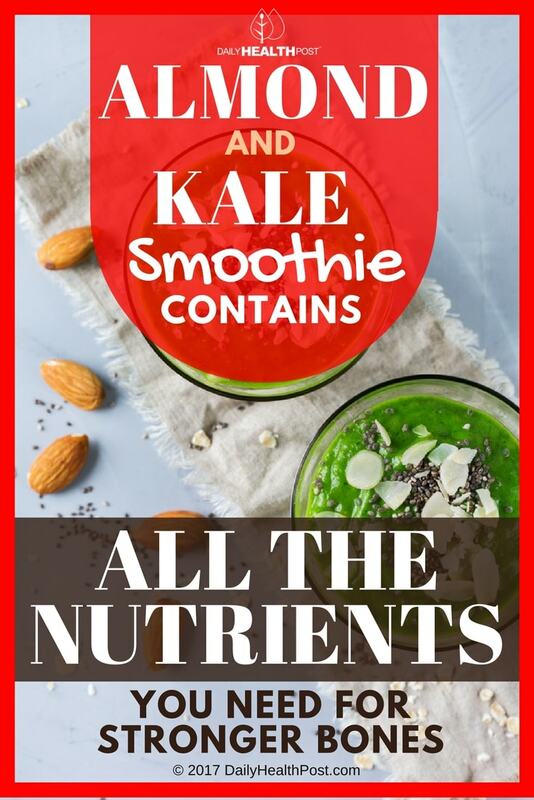 Combine all ingredients in a blender at highest speed until smooth.